Click for full view. All rights belong to Sardis Verlag. Stretch above is one of the most interesting maps of the Roman Empire ever made, all carted in detail using modern computational techniques. 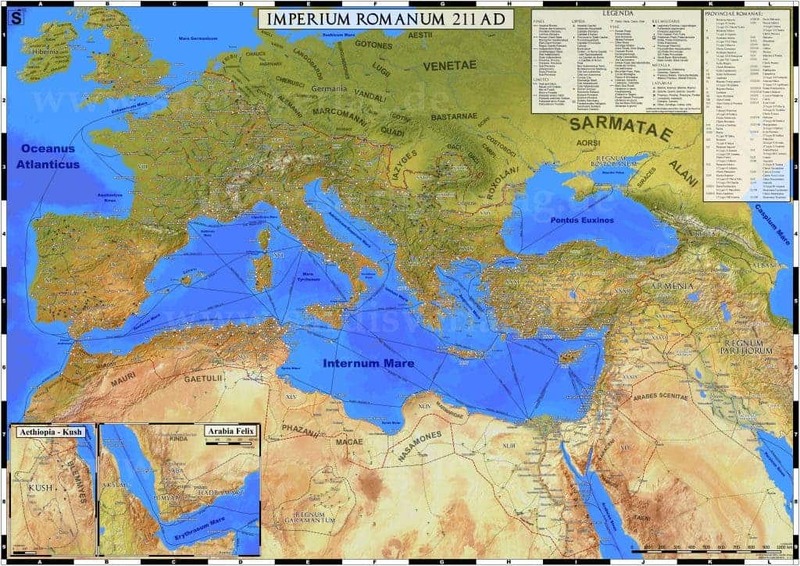 It shows what the great empire used to look like during its period of maximum expansion under the reign of Septimius Severus, about 211 CE. As you can notice, the Romans’ domain covered much of Europe, from the Atlantic to the Ural Mountains and from modern day Scotland to the Sahara or the Arabian Golf. After Septimius Severus died, all four emperors that followed were assassinated. Rome at the time became a monster too big for its own good. Corruption had eroded the empire and it would culminate with the Crisis of the Third Century, which saw the empire almost obliterated at hand of civil war and foreign invaders. Here’s some more tidbits from the map below. You can order a printed, high DPI copy here.